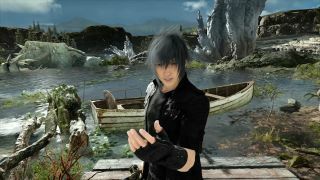 Final Fantasy 15's VR experience feels as eclectic (in a good way) as the main game that spawned it. You may not find any Cup Noodle helmets in this PlayStation VR exclusive, but it's just as bizarre being able to immerse yourself in a first-person fishing retreat with the boys, reeling in all manner of lifelike or horribly monstrous catches. With the headset on your noggin and two Move controllers in your hands, you too can have the immersive experience of a relaxing Final Fantasy fishing trip - that suddenly turns terrifying. Things start out pleasantly enough. Having accepted your 'Mission of the Deep', you make your way to a tropical clearing, where everyone's favorite pretty boy Prompto cheerily greets you. He asks if you want to fish (though the 'No' response doesn't deter him), and informs you that you'll be his muse for his set of photographs. Rather than playing as Noctis, who had the ability to fish in the JRPG's campaign, you create a custom avatar to act as the fifth member of the band (though this feature wasn't playable just yet). The demo starts in earnest with you standing in a fixed position at the base of a tropical grotto, with a beautiful view of the bay and plenty of exotic flora at your back. Catching your first few fish is a cinch: simply scan the depths with your handheld sonar device by tapping the left Move controller's thumb button, then cast the line towards the blue circles that denote a nearby fish by making a forceful flick with the right Move controller (which sways gracefully in the air, complete with a pretty light trail on your lure). There's barely any waiting around, at least in the demo; hit your mark, and the fish will bite almost immediately. All that's left to do is pull it in by holding the left trigger and cranking away at the virtual reel, adjusting the pole's position in response to on-screen arrow cues to ensure the lunkers don't get away. Try as I might, I couldn't get the line to break and let the fish escape once I had a bite, even when pulling in the opposite direction I was supposed to; again, this assured catch may just be part of the demo to help move things along. There's a decent variety of the types of fish that populate the nearby waters: one resembled a salmon, another a long-nosed gar, even a large tuna with eerily human-like eyes. I swear my sonar picked up the unmistakable outline of a Cactuar once, but sadly it didn't bite before other fish took the bait. After you've caught a few fish, Prompto will snap a photo - which suddenly turns into an AR experience, as the PlayStation Camera displays what it's seeing in the real world, but with one of your catches in place of a Move controller. I posed as if I was going to devour the wide-eyed tuna with one gigantic bite. Then things take a turn for the frightening, in a segment that somewhat resembles the original FPS-style concept for FF15's VR component. You're whisked away to another idyllic grove, only now, the titular Monster of the Deep is bearing down on you, leaping out of the water to literally smack you in the face. The fishing rod that was once in your right hand has been replaced by a crossbow, as the peaceful recreational activity turns into a lightgun shooter: you need to weaken the colossal, scaly, spiny Monster with a hail of crossbow bolts before it reaches you. Fail to do so, and the Monster will lunge at you with its glowing red eyes and gaping mouth that momentarily consumes the screen - a sight that made me reflexively jolt in fear, as if I was suddenly putting my head in a crocodile's mouth. The thought of being subjected to another first-person simulation of what fish (or shark) food must feel like motivated me to fire crossbow bolts with deadly accuracy, until finally I had whittled down the Monster's health bar and it was stunned enough to catch. The crossbow reverts back to a fishing rod, and with one last, mighty pull, you reel in the mutated sea bass which vanishes into a plume of magical purple mist. To celebrate, the gang shares a laugh around the campfire with some grilled fish skewers, and Prompto hands you a picture of the shot you snapped earlier. I must admit, I was mildly creeped out when Noctis' mouth moved as if with laughter, yet no sound came out; hopefully that bit of weirdness isn't final. My Monster of the Deep demo felt like so many VR games before it - a pleasant thrill ride that probably wouldn't stay interesting after multiple playthroughs - but I'm hopeful that the full game will be something like the FF15 take on the River King series, with the gang visiting multiple fishing spots around Eos in search of the rarest (and most intimidating) catches, all while amassing an impressive collection of meaningful gear. You'll be able to fish for yourself when Monster of the Deep: Final Fantasy 15 debuts on PlayStation VR for $29.99 on November 21.